For outdoor applications of wood, we have a strong tradition here in North America of using our naturally durable species: Western red cedar, Eastern white cedar, yellow cypress and redwood. These are familiar lumber choices for decks, fences, siding and roofing. These species are resistant to decay in their natural state, due to high levels of organic chemicals called extractives. Extractives are chemicals that are deposited in the heartwood of certain tree species as they convert sapwood to heartwood. In addition to providing the wood with decay resistance, extractives also often give the heartwood colour and odour. 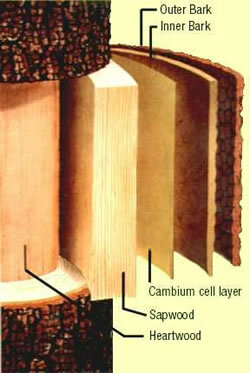 Only the heartwood has these protective deposits. The sapwood of all North American softwoods is susceptible to decay and must be chemically preserved when decay resistance is required. Sapwood is the newer part of the tree, closer to the bark. It needs no decay protection in the live tree because wound responses keep out any invading organisms. The heartwood is the inner, older part of the tree and is no longer alive. Heartwood is often visibly distinguishable from sapwood by colour (heartwood is generally darker), but not in all species. However, even if you’re sure you have heartwood of a durable species, you may not have the level of resistance you think. Decay resistance can vary from tree to tree, and may be lower in plantation-grown trees. There is currently no way to tell if a given piece of cedar heartwood, for example, is highly resistant or only moderately resistant to decay. FPInnovations is investigating these complexities of natural durability and trying to reduce the variability from tree to tree. Click Here for a table showing natural durability rankings of common softwood species.